Both my significant other as well as the daughter are active members of the Trombone Choir of our local Lutheran Church in Feucht, a small town just outside Nuremberg. So music is an important part of the family, and although I don’t play any instrument I enjoy listening to the Trombone Choir very much and I’m also paying my duties as the (unofficial) company photographer. Which led to some spectacular travel for me when accompanying the Choir on a trip to Tanzania earlier this year (I still want to do a blog post about this trip and my Street Photography in Africa). Fixtures of the Choir around Christmas time are concerts in St. Sebald (more about the history of this 800 year old Basilica at the end of this post) and on the stage of the famous Christkindlesmarkt (coming this year on December 23rd). The sound of the brass music in this huge church is spectacular and makes you shiver to the bone. I recorded a video of one of my favorite pieces on my iPhone, just to give an impression how it sounds, although it can’t match reality. This is actually a first on this blog, I never posted a video so far. Let me know in the comments how you like it. The piece played is the Christmas Choral “Tochter Zion, freue Dich” texted by Friedrich Ranke (1798-1876) based on music by Georg Friedrich Haendel. It is so amazing when at the end of each piece the last tunes raise up towards the ceiling and then slowly fade away. 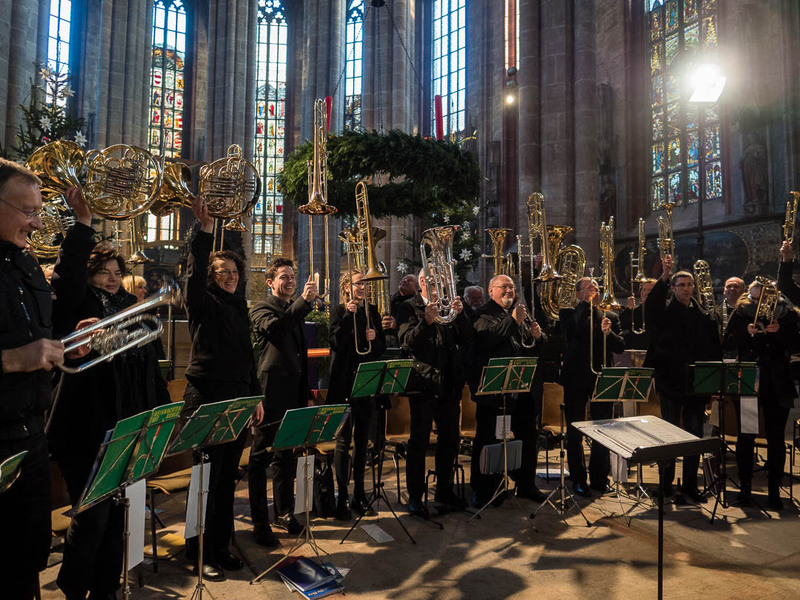 After the concert, while receiving the well deserved applause of the audience, the choir raises the instruments to the traditional “Bläsergruß”, the salute of the brass players. St. Sebald is one of the two main churches in the Old Town of Nuremberg. Construction of the Basilica, which is situated at the Albrecht Dürer Platz and opposite the City Hall, began early in the 13th century. Along the centuries the huge church was remodeled various times to now have a mainly gothic interior. It was severely damaged in the second World War. 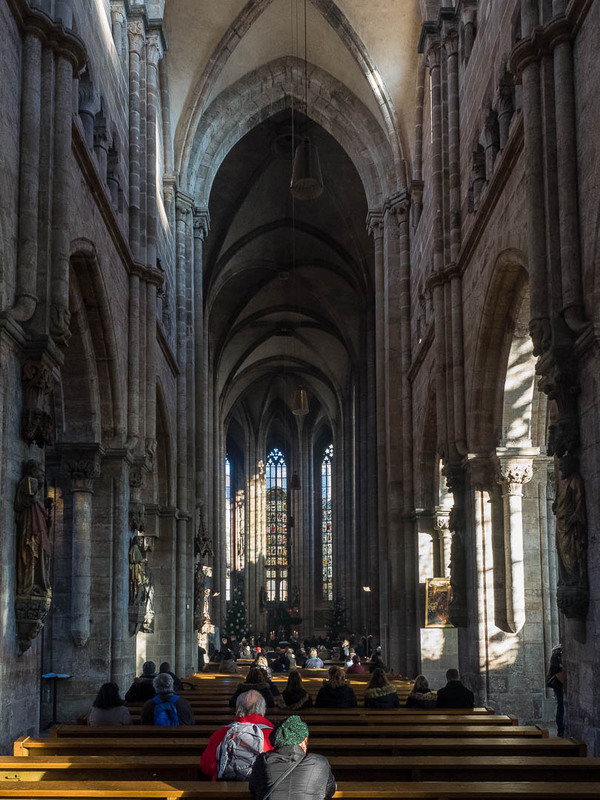 Priceless artworks that survived are the bronze shrine of Saint Sebaldus (a work by famous artist Peter Vischer and his sons in the years 1508-1519), wooden sculptures by Veit Stoss (1447-1533) and some the original glass windows from 1500, designed by Albrecht Dürer and made by glass painter Veit Hirsvogel. 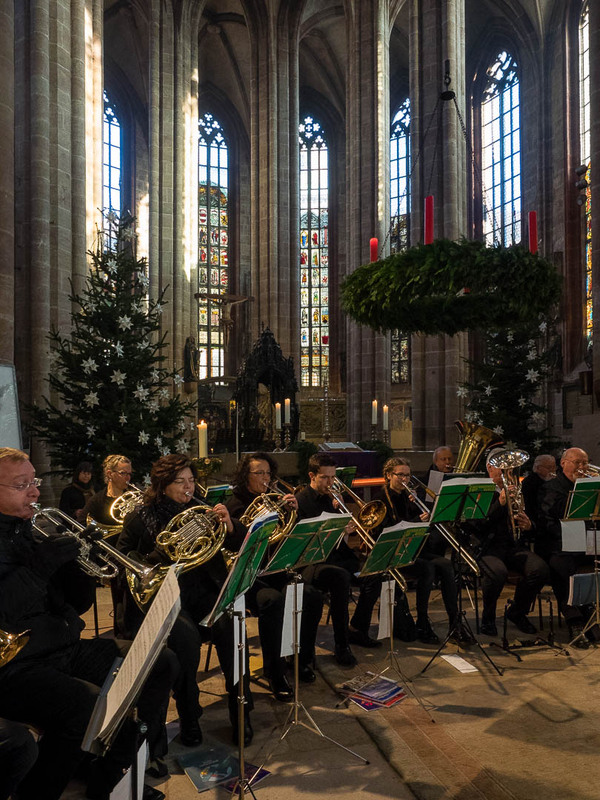 I hope you enjoyed this off-topic post about church brass music and a bit of history to one of Nuremberg’s magnificent churches. 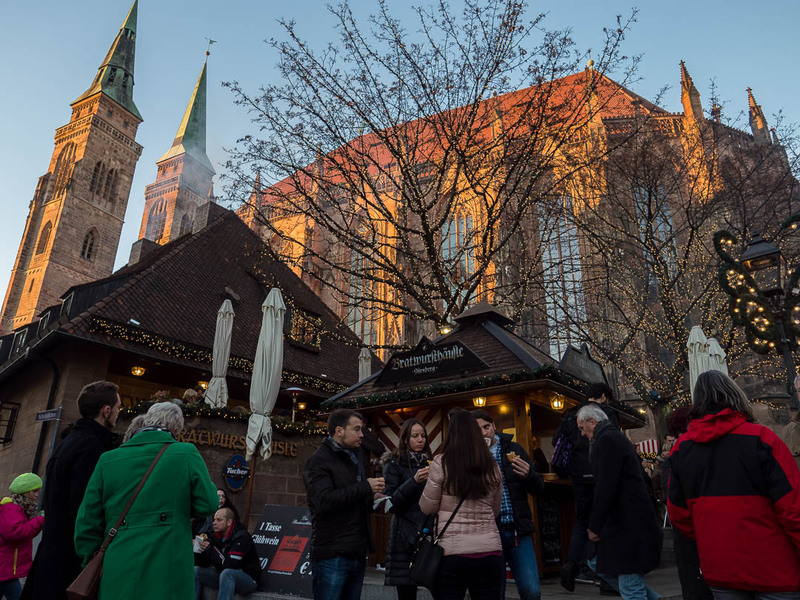 If you missed my previous post about my visit to the Christmas Market next to the church click on the link “Christkindlesmarkt” below. The images inside the church were taken with the Olympus OM-D E-M1 and the mZuiko 12-40mm f/2.8, the outside shot with the PEN-F and the mZuiko 12mm f/2.0. Thanks for sharing this music. Beautiful stuff. I love brass music. I had the same question as posed earlier: about the name trombone choir, and also about the word ‘choir’, wich makes me think of human voices. This aside, I like the video and the pictures very much and I as well are very curious about the Africa trip. Absolutely beautiful and of course you were right and I loved the post. So nice to hear the music in the video and I was reminded of how much it is a part of the festivities and Christmas time. Thank you for sharing Marcus. I understand all too well and remind you that with every passing hour you are closer to those better times. Wishing that they pass before you know it. Thanks for your kind words. I normally don’t do videos. I’ve taken that decision consciously because I have my hands full with my photography and I feel I couldn’t do both properly, so it’s photography only, with a few exceptions. Thank you for the nice photographs and the music. On Saturday, we did the Oratorio de Noel by Camille Saint-Saens with our choir at another church in Nuremberg. Thanks for visit and comment! I would have loved to hear the oratorio as well. Thank you for your post. Nice to hear something about your family. I enjoyed the video. I know the tune as “Here the conquering hero comes” It was played on our wedding on the 17th centurty organ of the cathedral in Dordrecht. It still gives me gooseflesh. Thanks for your kind comment. I love this choral so much and can imagine it fits a wedding ceremony well. I love brass. Daughter played tuba, son, trumpet. Why is it called a trombone choir when there are also French horns. trumpets, at least one tuba and a baritone? I would call it a brass choir. I love the shot where they all raised their instruments. Thanks, glad you like the post. I will actually investigate and report back why it is called a Trombone Choir. Actually, all brass choirs that are part of a Lutheran parish are called “Posaunenchöre” which translates to Trombone Choir, even though the have a full set of brass instruments. Beautiful! Very interesting to hear the music. Makes you feel more like you’re there, as opposed to just looking at a photo. What a beautiful church! Love the salute. Beautiful post. And PS: I’m looking forward to the Tanzania post. How fortunate that you were able to go there. I plan to some day. Thanks, love your feedback! It was my first multidimensional post! I can also provide a trombone choir video from the Tanzanian bush 😎! Yes! 🙂 I look forward to it.